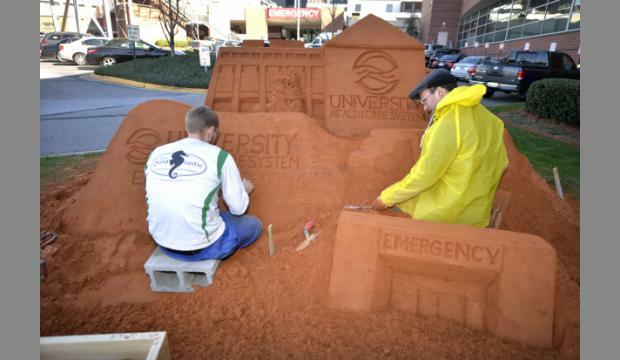 University Hospital CEO Jim Davis raised his shovel and demolished a sand sculpture representation of his old Emergency Department as staff cheered. Renovating the real thing will take a lot longer and a lot more effort. University held a groundbreaking ceremony Tuesday on its $30 million renovation of the department, which could take as long as three years. Davis said it has taken almost that long to plan it, having rejected two or three previous designs to get to this one. Unlike the current “maze,” this one will feature “pods” of 12 patient rooms ringed around a central staffing station that allows staff to access rooms more efficiently and quickly, said Mary Anne Nolan, director of Emergency Services. Instead of one central supply room now, each pod will have its own and it will greatly decrease the amount of travel staff have to make each shift, Nolan said. “It is not overstated to say staff can walk up to 10 miles in a shift,” she said. It also improves patient care, Davis said. “We’re very close to the patients all of the time and we’re also very close to all of the supplies and the equipment we need to care for the patients,” he said. It increases the ­capacity of the department, which was designed to handle 50,000 visits a year but last year saw nearly 83,000, Davis said. The new department will be able to handle up to 100,000 visits and increases the number of treatment rooms from 55 to 78. With an aging population that is frequently suffering more chronic health problems, about half of University’s patients are coming through the ER now, making it the “front door of the hospital” for those patients, Davis said.